The Fujifilm GFX 50S has a lot to tempt landscape photographers: a big sensor inside a weather-resistant body, coupled with the handling ease of a Fujifilm CSC. Two London Camera Exchange customers spent a day getting to grips with the mirrorless medium format camera on a day out with Digital Camera, in the Brecon Beacons in Wales. Sanj Maghera and Wesley Deprez are regulars at LCE’s Strand branch. Being a Fujifilm X-T2 user meant that Sanj was quickly up and running with the GFX 50S, and although Wes took longer to familiarise himself with the interface, he found the camera intuitive to use. Our day kicked off with a visit to Blaen-y-Glyn, where the River Caerfanell, the Nant Bwrefwr and other streams create a series of striking waterfalls. 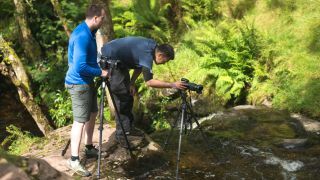 After a fairly wet summer, the waterfalls were in fine, full form, and Sanj and Wes wasted no time in setting up their tripods and cameras. The tiltable rear monitor proved to be one of the most useful features for this type of photography, allowing Sanj and Wes to place their cameras at low angles, close to the waterline. Not only did it make it easier to compose and frame shots, but being able to focus and operate the GFX 50S using the touchscreen meant that tripods could be placed mid-stream and the cameras operated at arm's length. Holding onto the camera straps ensured that the kit was in no danger of being washed away too! Light levels were fairly high in places, so LEE Big and Little Stoppers were used to extend exposure times and add motion blur to the water. The lighting was dappled, and exposing to record detail in the dark foreground areas meant that detail was being bleached out of the white waterfalls. Sanj fitted an ND grad to tame the highlights and produce a more balanced result – he prefers to get it right in camera rather than blending exposures in software. Both photographers made use of the Fujifilm GFX 50S’s self timer, opting for a two-second delay to ensure their cameras were rock-steady before shots were taken. They could have opted for wireless control of the GFX 50S using the Fujfilm Camera Remote app, but with one camera battery each and no charge points for miles, they opted for the traditional method in order to preserve battery life. We’ll be bringing you further updates of this Fujifilm GFX 50S field test on this blog, but you can see the results of Sanj and Wes’s day in the October issue of Digital Camera magazine, on sale in the UK from Friday 15 September.